Effective July 1, we will be increasing the price on our motorcycle luggage. We have kept our prices constant for many years but the increased costs for materials, labor and fuel necessitate the increase. Our cases are of the highest quality. They are still an excellent value and priced competitively. Call before July 1 to order a set before the prices go up! We’ll be at the 40th Anniversary Rally of the MOA Club in Sedalia, Missouri, July 19-22. It’s going to be a big one with terrific door prizes, music, and of course, shopping! Order at the BMW MOA rally and take advantage of free shipping! We will be selling our new product line, Excel Cycle Werkes, and showing all our luggage: Pilots, V-Pilots, V2s, Top Cases, Pack Racks, Backrests, Accessories and more. posted by Micatech | Comments Off on Fall Pack Rack Sale! The chipmunks are packing it in and you can, too! Get 15% savings on a Micatech Pack Rack and carry all your extra gear this fall. This versatile accessory is a rugged, aluminum luggage rack with multiple tie-down points for packing. The Pack Rack can be used as a stand-alone rack or as the platform to mount a Buy prednisone. Pack Racks include all mounting hardware and four quarter-turn receptacles for quick installation/removal of a Micatech Top Case – if you are looking for a little extra carrying capacity this season. posted by Micatech | Comments Off on Summer Rally Special! $50 off side cases + $50 off top case + free rally delivery (normally $75) = $175 in savings! Order your Micatech luggage in advance of the rally and we’ll deliver it to you at the rally for free! BONUS OFFER: We’ll provide technical assistance and loan our tools to help you install your new Micatech luggage! For pick up at the BMW RA Rally in Chippewa Falls, WI orders must be placed by Friday June 17th. For pick up at the BMW MOA Rally in Bloomsburg, PA orders must be placed by Friday July 8th. What are my savings if I’m ordering a set of side cases and a top case? What are my savings if I’m only ordering side cases? What are my savings if I’m only ordering a top case? I’ve never been to a rally. What’s it like? Thousands of motorcyclists from all around the country come to celebrate the motorcycle lifestyle! Start your morning with a cup of coffee before and then head out for a solo ride or join a group ride through the spectacular countryside. Head back to the rally grounds for some lunch and a stroll through “Vendor Alley” where you’ll see all the latest high quality motorcycle gear and accessories from hundreds of vendors. After you’ve done your shopping, sit in one of the many amazing presentations before eating some delicious BBQ with your new friends. After the sun goes down, enjoy a cold beer while listening to live music. Finish off with some chit-chat around the campfire and the rest up for another fun day tomorrow! Click these links to learn more about the RA rally and the MOA rally. Do I need to ride a BMW to attend the BMW RA and MOA rallies? No! All bikes are welcome! Whether you ride a street bike, a dual sport, a tourer, or even a moped, you’ll have fun at the rally. Will you install the product for me? We’re a 2 person team and although we’d love to install it for you we simply won’t have the time at the rally. However, since we’ve done hundreds of installs we know a thing or two about making it go smoothly. We’ll provide you with printed installation instructions, lend you our tools and will be close by to help answer any questions you might have. 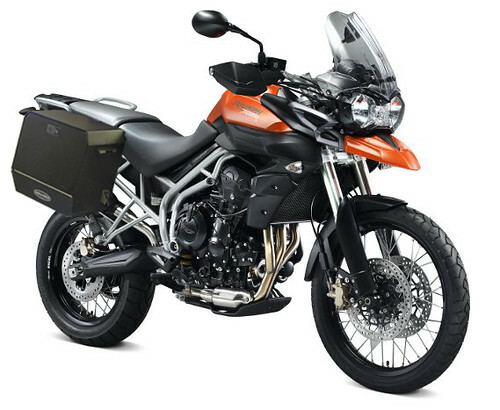 posted by Micatech | Comments Off on Triumph Tiger 800(XC) Promotion Extended Through May! Thanks to everyone who has purchased a set of Micatech V2 Cases and SW-Motech Racks for the new Triumph Tiger 800 and 800XC. We know you have luggage options and we thank you for choosing Micatech Motorcycle Luggage! In these first few days of May we’ve received several emails and phone calls from riders asking if they can still get in on the Triumph Tiger 800(XC) Promotion. We were happy to oblige and decided to extend the promotion through the month of May. If you’re still on the fence about luggage for your new Tiger, here’s your chance to save $75 on a set of top notch panniers!